How Do You Spell SURFING? 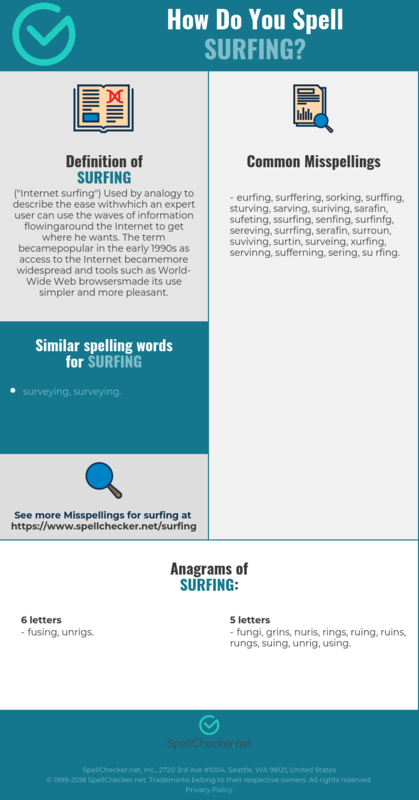 Correct spelling for the English word "surfing" is [s_ˈɜː_f_ɪ_ŋ], [sˈɜːfɪŋ], [sˈɜːfɪŋ]] (IPA phonetic alphabet). 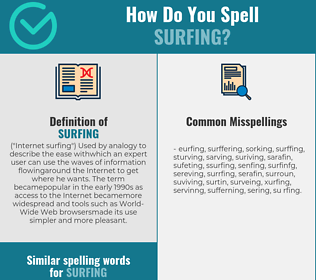 Below is the list of 304 misspellings for the word "surfing". ("Internet surfing") Used by analogy to describe the ease withwhich an expert user can use the waves of information flowingaround the Internet to get where he wants. The term becamepopular in the early 1990s as access to the Internet becamemore widespread and tools such as World-Wide Web browsersmade its use simpler and more pleasant.